Melbourne University Athletics Club has finished 2009 with a strong effort in Round 9 of the Athletics Victoria Shield Competition at the Harold Stevens Athletics Centre in Coburg on Saturday, 12th of December. MUAC has been rewarded for consistent performances during the season so far with all five open teams on their way to the Region Final in early February. Three rounds remain in January before the finals and there is much training and competition left in the summer track and field season. Paul Kennedy continued his fine season of race walking, notching up his ninth win from nine starts this season in the 3000m walk. Lauren Jauncey took out both the Long Jump and the 200m to show that she will be a significant presence when the State Championships occur in March. 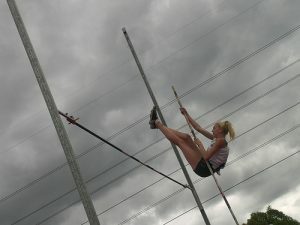 Leon D’Onofrio and Kath Iannello won the Pole Vault, maintaining MUAC’s dominance of the event for the season. Jarrrod Pageot leapt straight onto the top step of the podium with a win in the Long Jump at his first competition for the year. Tom Donovan soared to take out the High Jump with a leap of 1.95m. 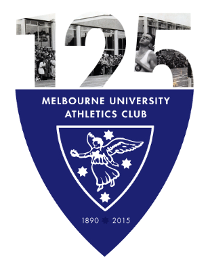 Melbourne University Athletics Club’s teams have consolidated their positions in finals qualifying spots with three rounds to go in the Shield competition. The Women’s Division One team is in second place, and will be a strong contender for the overall Shield Championship in March. The Women’s Division Two team will also make an appearance at the finals, with MUAC being one of only five metropolitan clubs to qualify two Women’s teams. The Men’s Division One team is 3 points clear on top of the ladder and will push hard to take out the Shield Championship. Men’s Division Two and Three will be strong contenders at finals time and MUAC will be one of only two clubs with three men’s teams in the finals, a testament to the commitment of the athletes and the depth within the club.